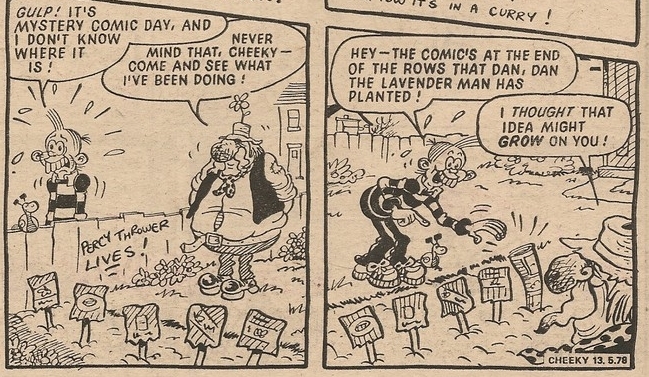 Compost-encrusted school gardener Daniel McSpaniel, better known as Dan-Dan the Lavender Man (a nod to the mythical but similarly-double-forenamed Lavatory Man) first appeared in the 'Ello I'm Cheeky strip in Krazy dated 04 June 1977, although he had previously enjoyed a one-off outing in a different role. Special mention should also go to Krazy's 29 October 1977 issue, which featured an attempt on the World Garden Joke record, overseen by the humorous horticulturalist. This was Dan's second and final Krazy outing. 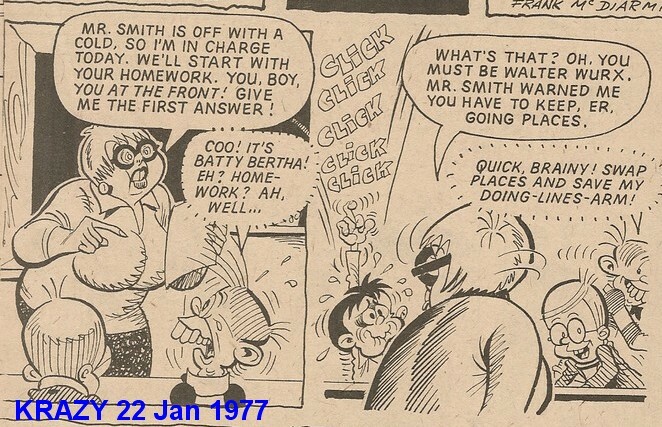 Cheeky's first encounter with the batty bulb-botherer within the pages of his own comic occurred on Sunday in Cheeky Weekly dated 10 December 1977. 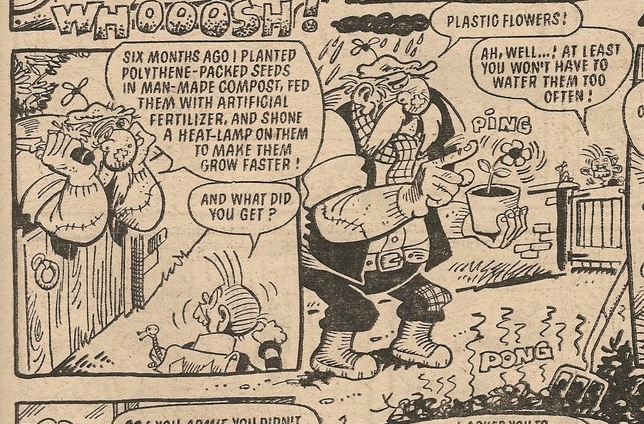 The Percy referred to in the strip above is pioneering TV garden guru Percy Thrower. 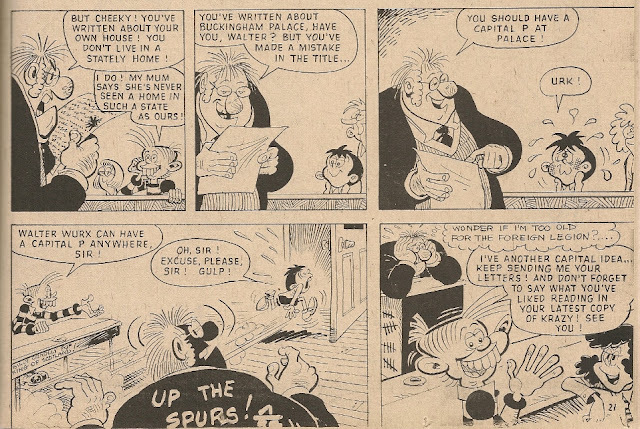 It would seem that Dan then went into hibernation, reappearing as spring sprung in the 15 April 1978 edition, on the Sunday and Suddenly pages. 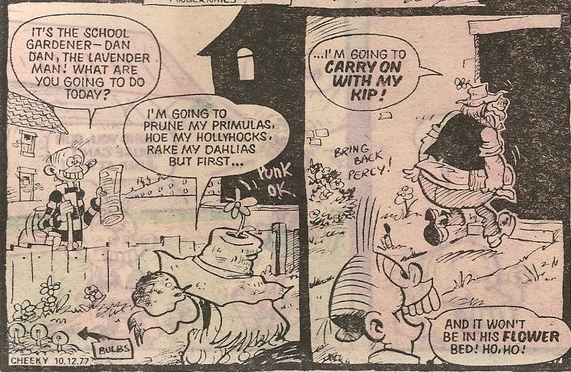 The green-fingered geezer set the Cheeky's Pal Puzzle poser in the issue dated 07 October 1978 and, unlike the previous winter, continued to be seen sporadically in the school garden during the months when most gardeners stow their dibbers pending the return of warmer weather. 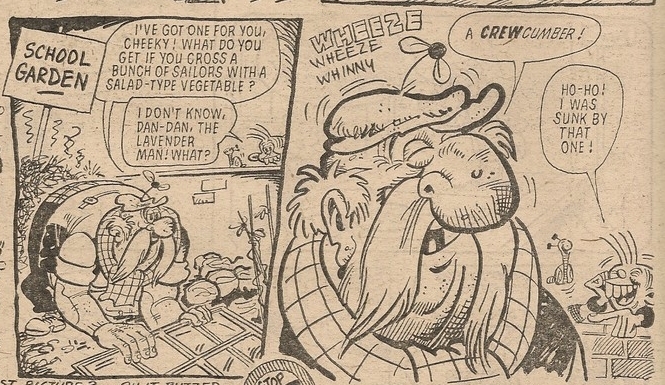 An image of Dan leaning on his spade, lifted from the Thursday page of the comic dated 25 November 1978, appeared on the Pin-up Pal Poster published in Cheeky Weekly dated 03 March 1979. 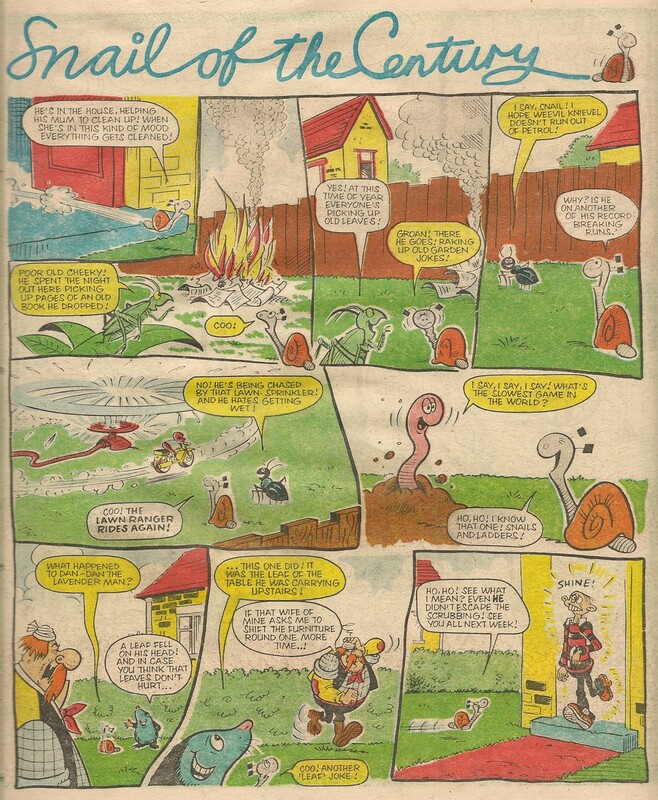 Snail of The Century in the 20 October 1979 issue included a cameo by Dan who had evidently relocated to Cheeky's garden for this appearance. Dan wasn't among the select band of pals seen chez Cheeky enjoying the toothy funster's Christmas/new year revels. Presumably Cheeky's mum was reluctant to invite the school's seed-sower in view of the state of his wellies – almost as bad as the niffy adornments on Farmer Giles' footwear. 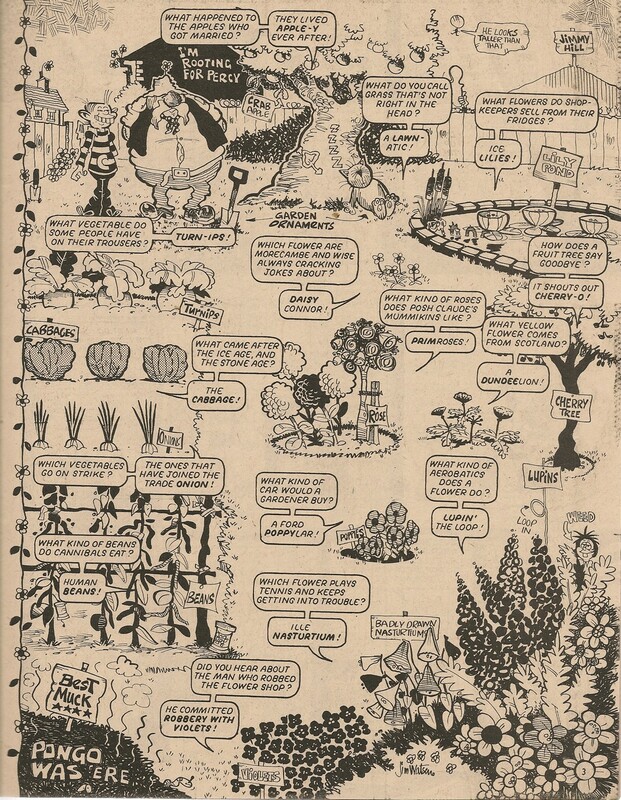 Our grinning hero's plantsman pal didn't quite make it to Cheeky Weekly's final edition, trowelling out his farewell gardening gag in the penultimate edition dated 26 January 1980. 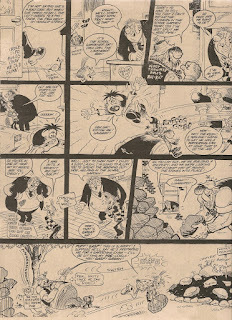 Cheeky Weekly readers were able to dig Dan who, due to his association with the toothy funster's school was most regularly seen on the Friday page on which Cheeky's scholarly endeavours were recorded, in a total of 48 well-mulched issues. Peter Gray is certainly keeping up the pressure for a collected Cheeky Movie Masterpieces - he's posted another one. My favourite MM is Planet Of The Japes. When I've completed my review of Cheeky Weekly I plan to examine the post-Cheeky Weekly careers of the survivors, so when I do a post on the Movie Masterpieces I'll show Planet Of The Japes (but by that time Rebellion will have published The Collected Movie Masterpieces, so you'll all have seen it, anyway). 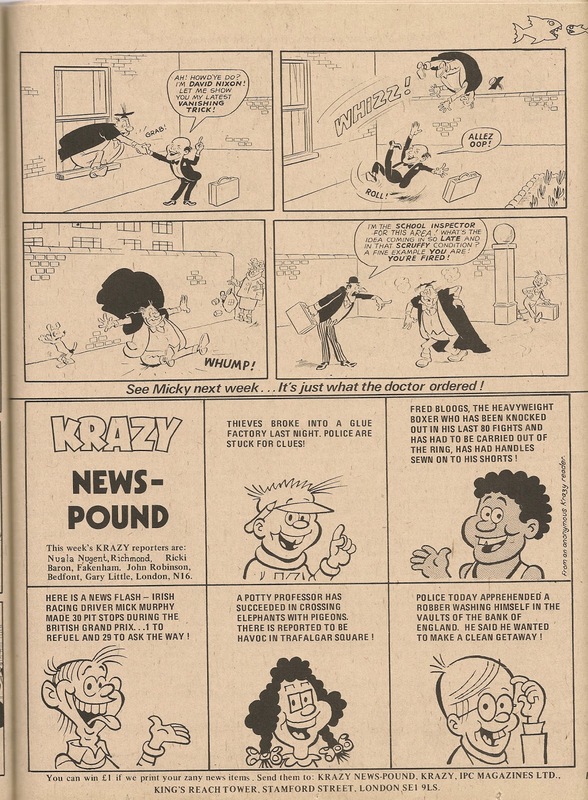 From Krazy dated 22 January 1977 - this Micky Mimic story, including a cameo by the toothy funster, is drawn by Arthur Martin. It would have been nice to see Teacher in this strip, but on at least one day that week he was off sick so wasn't available (he'd probably read the script for the above story and, realising that it culminated in the schoolmaster antagonist being sacked, threw a deft sickie). 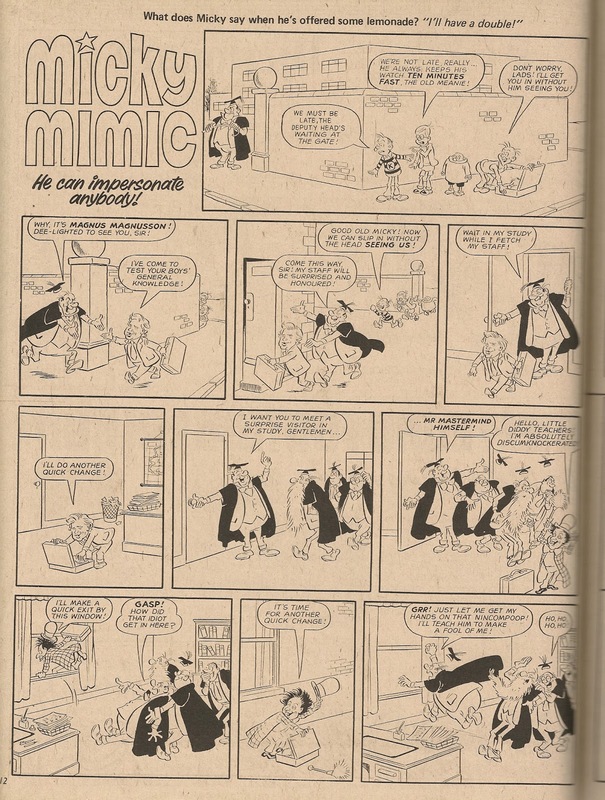 Immediately following the Micky Mimic story above, Cheeky appears again in the Krazy News-Pound half-pager, where he's drawn by Ian Knox, who was the regular artist on The Krazy Gang (which numbered Cheeky among its members) at this point. 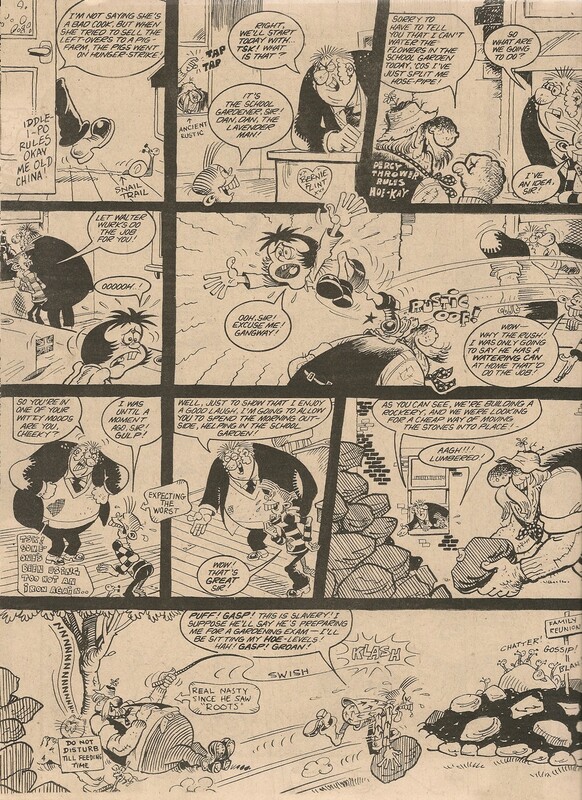 Peter Gray has suggested that Rebellion's upcoming and highly exciting Treasury of British Comics series reprinting classic IPC strips should include Cheeky's Movie Masterpieces which originally appeared in Whoopee! and Cheeky. This is a cracker of an idea and seems like a sure fire winner to me - the series featured some top-notch scripts and excellent work as ever from Frank McDiarmid. 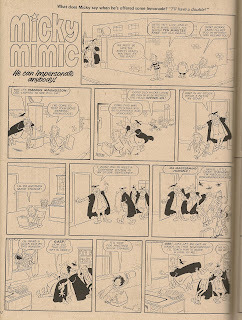 In addition to being popular with Cheeky fans, a collected MM would also appeal to readers interested in movie spoofs. Come on Rebellion, let's see this on the schedules soon! 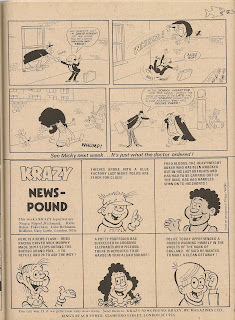 Over at the Great News Blog, David is looking back at the 01 March 1980 edition of Whoopee!, the fourth issue of that title to be published since it subsumed Cheeky Weekly. The cover of the Cheeky comic-within-a-comic that week featured a character sporting molars to rival those of the toothy funster himself.